Two of the three East Sussex Football League Premier Division title contenders were in league action last weekend - and both of them won. Battle Baptists remain top on goal difference following a 4-2 victory away to eighth-placed Northiam 75. Jamie Lindsay scored a hat-trick and Josh Pickering netted the other goal for Battle against a Northiam side which replied via a Kieron Moss double. Sidley United moved up to second on the back of a 3-0 success away to second-bottom St Leonards Social. All the goals came during the second half. An own goal set the ball rolling before strikes by Mark Funnell and Lee Carey secured Sidley’s eighth consecutive win in all competitions. Battle and Sidley are both three points ahead of third-placed Bexhill Town, albeit having played an extra game. In-form Sedlescombe Rangers climbed to fourth courtesy of a 2-0 triumph away to sixth-placed Rye Town. Kasey Smith and Kye Phillips found the net for Sedlescombe against a Rye team which they beat 6-0 in a cup semi-final just two weeks previously. Wadhurst United’s quest to chase down Division One leaders Punnetts Town suffered a setback as they were held to a 2-2 draw away to Crowhurst. The goals of Dean Tincombe and Matthew Jones for Wadhurst were matched by Sean Lennard and Jack Harman for the Crows. Fourth-placed Wadhurst, who are still unbeaten in the league, are now 13 points behind Punnetts with five games in hand. Second-placed Icklesham Casuals, who cannot catch Punnetts, suffered a 3-1 defeat away to seventh-placed Hollington United II. David Pugh found the net for Casuals. Sixth-placed Bexhill United II won 3-0 against second-bottom Herstmonceux at a windswept Polegrove. Andrew Matthews, Jacob Lee and Ben Packer got the goals. Division Two top dogs St Leonards Social II finished their league campaign with a 4-3 victory away to fourth-placed Sedlescombe Rangers II. The goals of Gavin Ramsden (2), George Murray and Joe Murray kept Social at the head of the affairs. But second-placed Battle Baptists II are only two points behind them having played three less matches after they won 3-1 at home to fifth-placed Catsfield. Michael Hiett, Ryan Souter and Joshua Reuter netted for still unbeaten Battle. Rock-a-Nore are up to third - eight points behind Battle with two games in hand - following a 4-1 success at home to The JC Tackleway II. Liam Miles plundered a hat-trick and Reece Johnson got the other for the Rocks, while Jamie Adams scored the consolation for a Tackleway team now certain to finish second-from-bottom. Already-crowned Division Three champions Bexhill Rovers extended their advantage at the top to four points with a 4-1 triumph away to Orington. Luke Alais, Tom Mills, Iain Stuart Powell and Mark Phillips struck for Rovers, while Scott Quested netted the consolation for an Orington side which will finish sixth. Cranbrook Town boosted their bid to finish runners-up in Division Four by winning 3-0 away to Sedlescombe Rangers III, who now can’t escape the bottom two. Wayne Beaney’s brace and one from Thomas Budd means that Cranbrook will end up second if they win their one remaining fixture. Lee Pierce bagged a hat-trick as fifth-placed Icklesham Casuals II wrapped up their league programme with a 5-3 success at home to eighth-placed Parkfield. Phil Badrock and George Barrow also hit the net for Icklesham, while Timotey Tockas and Oliver Truman were among the scorers for the visitors. AFC Hollington went top of Division Five after finishing their league matches with a 6-1 victory at home to fourth-placed Burwash. Rhys Warren (2), Steven Payne, Mark Blanche, Joshua Blanche and Kelvin Lowes hit the net for Hollington, while Blake Marchant scored Burwash’s consolation. That result means Little Common III will need to win their final league game, at home to third-placed Welcroft Park Rangers, by two goals or more to be guaranteed the title. Robertsbridge United reached a cup final for the second successive Saturday. 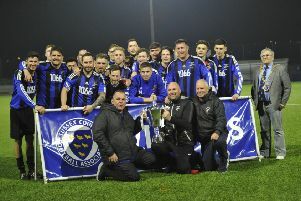 After booking their place in the Robertsbridge Charity Intermediate Cup final the previous weekend, the Bridge won 2-1 away to Bexhill Town in the second Hastings & District FA Intermediate Cup semi-final. Simon Tomlinson gave Town a half time lead in an all-Premier Division affair, but second half strikes from Curtis Coombes and Paul Barnes put Robertsbridge through to a final showdown against Sedlescombe Rangers, who themselves are through to two cup finals. That match will take place at The Pilot Field, home of Hastings United, on Tuesday April 23. Robertsbridge will have the chance to reach a third final when they host Sidley United in an ESFL Premier Travel Chauffeurs Challenge Cup semi-final tomorrow (Saturday). Northiam 75 II reached the Robertsbridge Charity Junior Cup final after winning 4-3 on penalties away to Robertsbridge United II. The game itself had finished 2-2 after extra-time. Ben Thorpe and an own goal were on the scoresheet for Division Two’s bottom side Robertsbridge, while Adam Page and Shaun Barkworth netted for a Northiam team lying fourth in Division Four. Northiam will face another Division Two outfit, Rock-a-Nore, in the final at The Pilot Field on Tuesday May 7. League matches are scheduled for all six divisions this coming Saturday, as well as the second ESFL Premier Travel Chauffeurs Challenge Cup semi-final and five ties in the ESFL Supplementary Cup Competition. The first final of the season will take place at The Pilot Field next Tuesday night, kick-off 7.30pm. Victoria Baptists will take on fellow Division Three outfit South Coast Athletico for the right to lift the ESFL Wisdens Sports Challenge Cup.